UPDATE!!! THIS CAMPAIGN HAS REACHED ITS GOAL AND IS OFFICIALLY OVER!! I want to thank all the listeners who noticed the importance of this fundraiser and kindly donated! I thank you all from the bottom my heart!!! Hello fellow listeners and Jazz fans, please take a minute to read this urgent message. I have created a "Fundraiser" drive in order to meet the "EXTRA" fees that have been forced upon me. The future of Jazz Con Class Radio broadcasting all day long is in jeopardy now. This unique Jazz internet radio station has been broadcasting in a NON-commercial manner, 24 Hours a day and 7 Days a week since 2012. Yes, up to this month (April 2017) I have been able to match and pay for "ALL" the monthly fees it takes to maintain the broadcast alive. As of this month, I am paying MORE THAN TWICE as last year in broadcasting fees! Unfortunately, it has now become overwhelming, they have added EXTRA FEES on top of the already high fees I presently pay. These BRAND NEW fees are specifically designed to place "Commercials" on the station. Now I am fighting against all sorts of sneaky "blackmail" type of tactics with these EXTRA fees. So, there are TWO goals that I am trying to accomplish with this fundraiser. First of all and with your help of course, I'm meeting and satisfying the NEW fees. Secondly and just as important, is the concept of Independence. 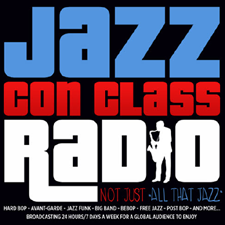 It might be a surprise to you but I'm constantly struggling for the INDEPENDENCE of Jazz Con Class Radio and for its REAL supporters, the LISTENERS! With your help this fundraiser will keep Jazz Con Class Radio broadcasting on a 24/7 basis and with ABSOLUTELY NO advertisements until the end of this year. The goal I need to reach with this fundraiser will ONLY help pay for the EXTRA FEES that have recently been added this month and for every month afterwards. Please, help KEEP Jazz Con Class Radio Independent and thank you for your attention!